Manila’s fashionistas will immerse in glitz and glamour at the swanky SM Aura Premier this June 12-14 for the Philippine Fashion Week. All eyes will be glued on the runways of the country’s biggest fashion event as it presents stunning holiday couture from celebrated style visionaries throughout the three-day spectacle. While the much-awaited Philippine Fashion Week promises to amaze with its featured sartorial collections and the tastemakers behind them, it expects to have the photography and tech aficionados in the crowd abuzz in capturing runway looks and behind-the-scene moments using their gadgets, posting their photos at once on their social media sites for the world to see. Recognizing the need for the industry’s elite to keep their mobile devices performing at peak for real-time audience engagement during Philippine Fashion Week, gadgets accessories company Gosh! has joined Power Mac Center to deliver charging solutions that allow guests to continuously enjoy the event without worrying about their mobile devices running out of battery life. As the Official Technology Retail Partner of Philippine Fashion Week, Power Mac Center will make possible for the Singapore-based brand to headline the utilitarian function and design elements of its newest lineup of power banks. “Power Mac Center is delighted to bring Gosh! to the runways of Philippine Fashion Week. With our partnership, we are excited to introduce to the local fashion world stylish accessories loaded up with power capacity to keep their gadgets functioning and allow them to stay online during the high-fashion event,” said Power Mac Center Marketing Director Joey Alvarez. Established in 2012 to scale up the experience in mobile accessories, Gosh! accentuates one’s persona and style in creating products that are of premium quality, unique, thoughtful, reliable and affordable all at the same time. Leading the Gosh! Powerbank Series is the JouleSurge +1200mAh Intuitive Vibration Powerbank. This portable charging device is elegantly designed with Electroplated Rims and aluminium body engineered to charge a mobile phone up to 6x its full capacity. Its compact size, stylish exterior, and ability to provide charging convenience on the go appealed to Rovilson Fernandez, who brought the Gosh! product with him during his recent adventure and research trip in Donsol, Sorsogon. The Filipino model and television host touted his smartphone as one of the important tools of the trade, and without enough power packed in his electronic device, work would come to a standstill. According to Rovilson, Gosh! extends the battery life of his mobile phone for use in web browsing, writing emails, and editing pictures. The brand also gives his gadget an extra swag with a sleek finish fit for the catwalk. “Gosh! 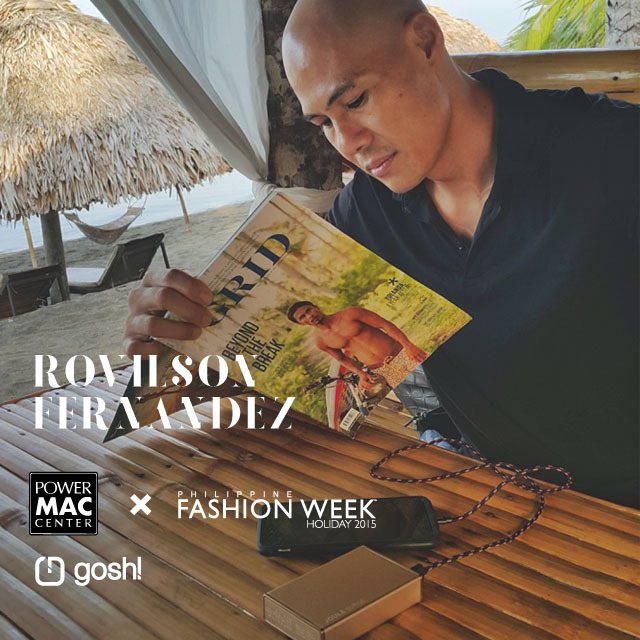 is a perfect complimentary accessory to the style conscious in need of a functional and fashionable tool for everyday living,” said Rovilson, Power Mac Center brand ambassador for Gosh!. The Gosh! Powerbanks Series will make a mark on the Philippine Fashion Week runways together with style purveyor Roland Alzate’s holiday collection dubbed “My Automne Hiver 2015.” He describes his latest fashion ensemble as “very Demi-Couture,” with an aesthetic appeal that embodies strong modernity. Roland, who travels the world to draw inspiration and conduct research for his collections, considers a power bank as his lifeline, and the kind of power bank crafted by Gosh! is “almost like tailor made” to fit his creations. “My 2015 holiday collection is very sophisticated and controlled, distinctive features that are also evident in the Gosh! Powerbanks Series—the elements of design, texture, volume and beauty intertwine well,” added Roland. Charging your mobile devices has never come with so much style and elegance with Gosh! Powerbanks Series available at all Power Mac Center locations nationwide.